It’s feeling a little like deja vu in the Big Brother 20 house this week as Scottie has returned via the Battle Back and has landed himself in the same predicament he was in before he left. 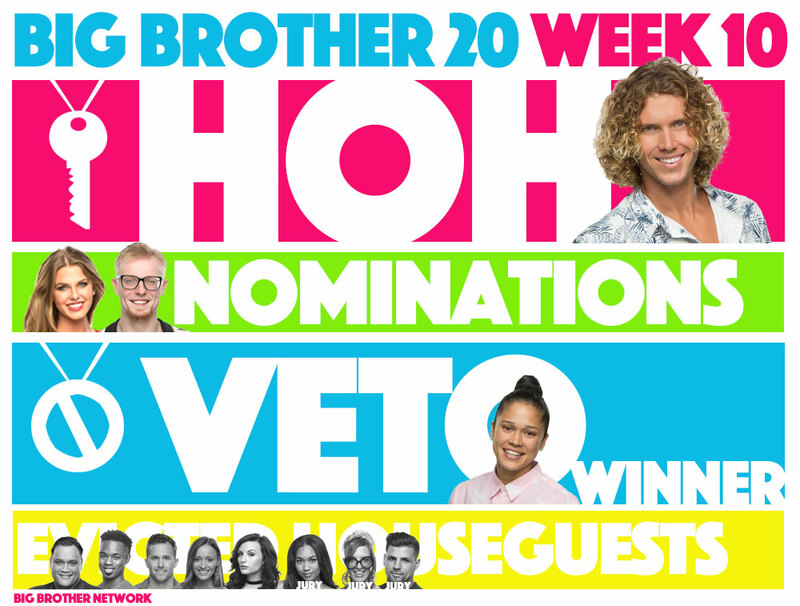 So that means we’ve got all the spoilers you’ll need through Monday’s veto meeting. Let’s take a look. If you tuned into the Live Feeds on Thursday night, you’ll know that the endurance competition played out live. The HGs were hanging on ropes and standing on discs while being spun around. We’ve seen that competition for the past few seasons, so it should be familiar to you. If you missed out on the Live Feeds that night then you might not know that it came down to Haleigh and Tyler and Haleigh took a pretty brutal hit and fall, leaving Tyler as the new Head of Household. Even though Haleigh begged to not be put on the block and Scottie kind of thought his boy Tyler would’t do it to him, they both found themselves nominated. Scottie thinks Haleigh’s the target and Haleigh thinks Scottie is the target. Tyler doesn’t really care which one goes home, he’s said, but the house is definitely leaning toward sending Scottie right back out. For the second week in a row it was Kaycee who took the gold. Who knew she would show up as a competition contender this late in the season after flopping so many times before. Level 6 is very happy for her win, Tyler in particular, because now nominations can remain intact and Tyler won’t have to get any more blood on his hands. Well, aside from Scottie’s. The Power of Veto meeting won’t go down until Monday afternoon, but it’s a pretty safe bet that Kaycee will again tuck the veto medallion into its little box unused. There’s no scenario I can imagine where Kaycee uses the veto. Tyler would have to be the one to tell her to do so first of all, and he’s definitely not going to want to do that. So expect the week to be pretty much a repeat of the past couple of weeks. It looks like Scottie will be going back to the jury house this week and Haleigh will have to win HOH next week if she wants to not find herself in the same place a third week in a row. What do you think of everything that happened in the Big Brother 20 house this weekend?